I was very excited upon my return to Adelaide that our local Coles has introduced a “Scoop and Weigh” section- i.e. 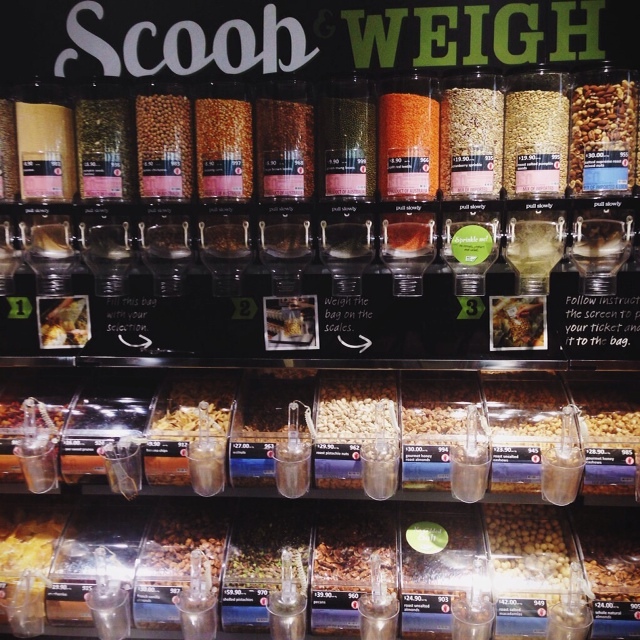 an option to buy bulk with the convenience and accessibility of a supermarket! Don’t get me wrong- I love the Adelaide Central Markets and the bulk options available there, however given the ridiculous traffic in Adelaide nowadays combined with the bad decision to conduct month-long roadworks on every single road leading into and out of the city, being able to get to the market relatively unscathed is a luxury (and a miracle). Given the option, I will always prefer going to the markets and bulk food store- however if you’ve been working late, and it’s now 8pm, cold, rainy and windy and you need to grab a couple of things for dinner- the convenience of popping into Coles (a major chain supermarket in Australia) on the way home to raid the bulk section can’t be beat. Luckily there was a nice lady there that day re-filling the bins, and I asked her if she knew how to take the tare weight off a jar with these machines. I can use thin muslin bags with these machines anyway, but for things like almond meal or fine grains, a jar wins for ease for transfer and cleaning. We entered into a fun conversation about possibly coming up with a protocol of sorts to enable people to take the tare weight off their own containers, and actually promoting the use of your own containers and discouraging single- use plastic. She was very excited by the idea, and told me that she is going to email her manager that afternoon about it, and for me to pop by in a couple of weeks to see if there has been any positive outcomes. Even if nothing comes of it, at least the idea is out there, and one more conversation has been had about zero-waste living. One of the surprising things about this journey so far is that most of my experiences have been positive, and that rather than have people turn me away or give me strange looks, everyone has accepted my own bags/ jars/ containers, and some have even been inspired to start their own zero-waste journey. I will start posting about my various successes with businesses in and around Adelaide, so that hopefully it will make it easier for anyone else living here to start going zero-waste too. It’s been a lot of trial and error, research, and what I call “conducting social experiments”. I am still in the testing stage, but I am enjoying the challenge! As the (sometimes) proud owner of an “Asian afro”, I shed a lot of hair. Hairdressers cower at the sight of my figure darkening the door of their hair salon (which often appears to only cater to girls with pretty, shiny Pantene hair). It’s thick, unruly, and bursts through elastic hair ties. It clogs hair drains and scares off boyfriends. I’m pretty sure no-one has ever nuzzled my hair (and I would like it to stay that way). Up until about a month ago, all of the hair shed in my bathroom would end up in the bin and was sent off to live in landfill. 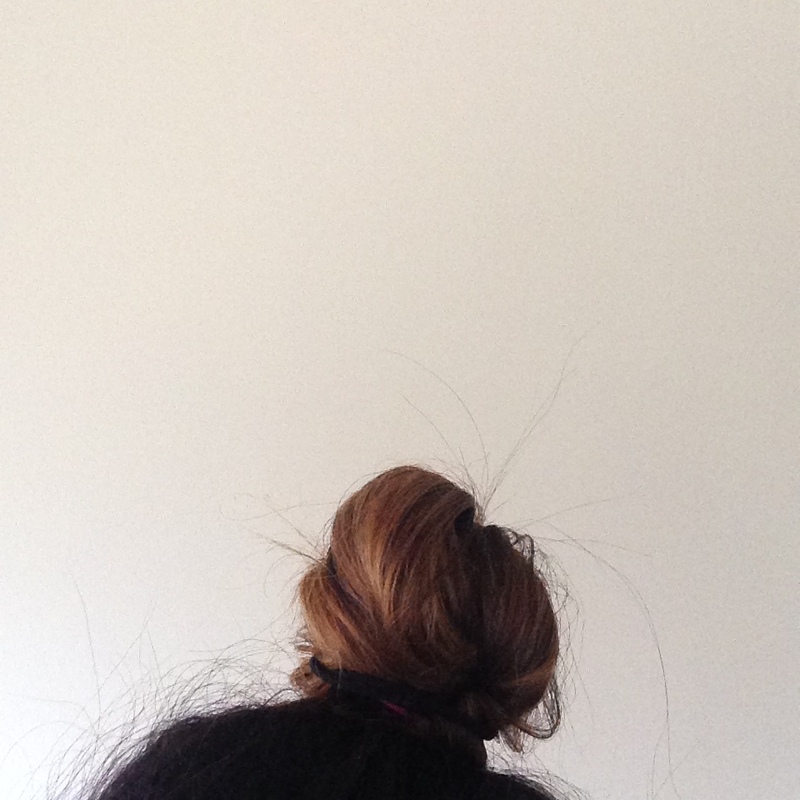 The thing that kicked off my zero-waste journey was discovering the fact that I could compost my hair. Mind. Blown. Other non-obvious things included tissues and paper towels, pizza boxes, nail clippings, corks. Basically anything that was once living could go in our kerbside “green” collection bin (more on that later). My next thought was- why didn’t anyone ever tell me this? I felt left out- like every one else was secretly scurrying home and composting and not telling me about it. #fomo. I suppose one of the things that I have learnt over the last two months is that unless you’re in the right circles (environmental studies majors and freegans I’m looking at you), you may never end up having a conversation about waste and landfills with your every day friends. Which saddens me- yes my social circles do consist of busy professionals who pledge allegiance to VW Golfs, but we all share the same Earth and we are all guilty of the same thing- trashing it. The concept of “zero-waste” still conjures up images of unwashed, dread-locked tie-dyed hippies, or worse- condescending, over-opinionated environmentalists. I believe that the concept of going “less (or zero) waste” can be applied to everyone, and is not just the domain of uni students, stay at home mums, or freelance artists and bloggers. The principles can be applied by everyone, no matter how busy you are. This is also not about being pretentious, or admonishing people for not being able to confine their trash in a mason jar. This is about starting a conversation, and discussing ideas, and coming up with small changes- one step at a time. I know people say- one less coffee cup? Who cares? Well- I do. That is one less cup to go to landfill. And even if everyone only remembered to bring their KeepCup once a week, or once a month- imagine the impact! I am known by my friends to be the ultimate hipster-fashionista- with a wardrobe bursting at the seams I am the exact female consumer prototype that is probably on a poster on the wall of a marketing firm somewhere. However over the past two months I have slowly made some lifestyle changes. Nothing drastic, but each change I made I made sure that once I implemented it- it would stay that way. Sustainable ideas for sustainable living. Zero waste is not a passing fad, and I wanted those thoughts and ideas to stay with me for life. They say it takes 30 days for a new habit to form, but it is so much more complex than that. Zero waste is a lifestyle integration, layered with testing out new concepts, consolidating habits and being continually inspired to do more and do better.